Check out the preview of Walgreens Weekly Ad that will offer great deals on pharmacy products including popular brands. 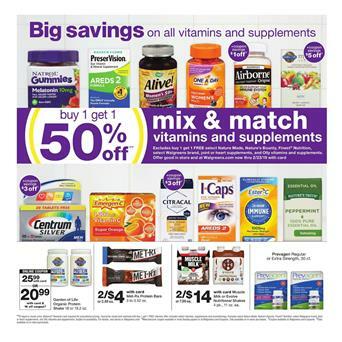 Mix and match sale on vitamins and supplements is one of the most popular deals that can be seen on pg 11. Alive!, One A Day, Airborne, PreserVision, Natrol Gummies, Ester-C, Essential Oil, I Caps, Citracal are all among the featured prices. Garden of Life Organic Protein shake, and more of the nutrition for people who want to take extra values apart from their daily routine. Nature Made Vitamin C, Magnesium, Fish Oil, and more. Most weekly health products can be restocked with the lower prices by Walgreens Weekly Ads. You can earn rewards. Earn $5 reward when you spend $25 on participating items. BOGO deals, coupon savings and more are valid deals on packs of allergy relievers, cold and flu medicines etc. on pg 15-16. Get your sleeping pills with a BOGO 50% off deal! Sleep aids or PM pain relief will be BOGO 50% off this week at Walgreens.